"Brittany was the cook and waitress at Rusty's Pub-N-Grub." 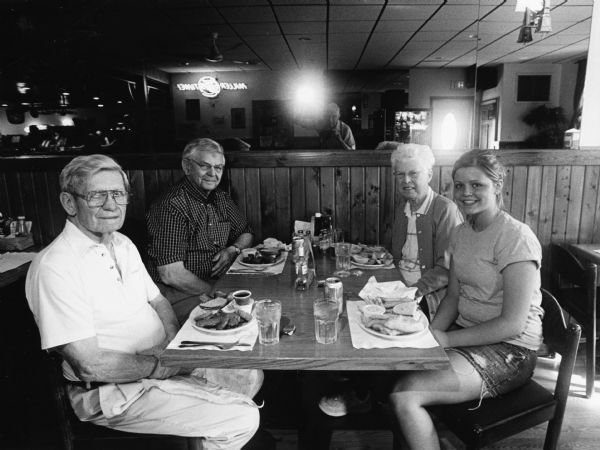 From left to right: Ralph "Buddy" Ruecker, Carl Bernhard, Shirley Widmer, and Brittany. Jim Widmer's reflection can be seen in the mirror. Loaned for scanning by Jim Widmer. Part of the series of photographs taken by Jim Widmer of fish fries in Wisconsin. Volume M, Page 20.